Is pretty much summed up by the succinct comment recently made by a friend .. “I don’t know if the devil wears Prada, but he definitely drives a Bentley”. The Dominionist Doctrine is a volatile cocktail of outright error mixed in with authentic truth, and Bible verses attached to complete fabrications. However their delusions make them more dangerous, not less. This movement, gathering momentum by the week, could very well bring about the fulfillment of Jesus’ prophecy in Matthew 10:21, which means that every Christian should be aware of who these people are and what it is they profess to believe. When one carefully examines the texts put forward to make the case that "slain in the spirit" and other related manifestations such as laughter, shaking and other bodily convulsions are phenomena rooted in the Scriptures, it becomes patently obvious that this is not the case. Holy Canon is void of any accounts, testimonies or experiences that even faintly resemble ‘Slain In The Spirit’. Where then does the practice originate? Unfortunately being slain/resting/shaking/being drunk in the spirit etc, along with "holy laughter" are only two more examples of doctrine that has been directly derived from occult sources. It has terrifying parallels with the Hindu practice of “awakening” a person’s Kundalini, a concentrated form of life force, lying dormant in our bodies and often awakened by a touch to the forehead by a guru c Not only are the the requirements for receiving are the same, but the resulting physical manifestations are virtually indistinguishable. How then can these practices be Christian? Here we go again… Writing another chapter in the history of a dysfunctional church. Bentley definitely has a positive function in life. He makes people like Benny Hinn and Kenneth Copeland look good… really, really good. Whatever rock in the furtherest reaches of hell Todd Bentley crawled out from, Satan is no longer bothering to conceal his minions behind the cloak of respectability (After all Robert Schuller does look and sound like someone’s benevolent grandfather). I wonder if Satan actually thought to himself.. “Lets see just how much these fool Christians will fall for. Let’s hand them someone with tattoos, and body piercings with a sleazy background and a penchant for Harleys... let’s arm him with a fistful of tall stories and top it all with his propensity for violence and see just how gullible these people are.”. Well what ‘happened’ is history in the making. 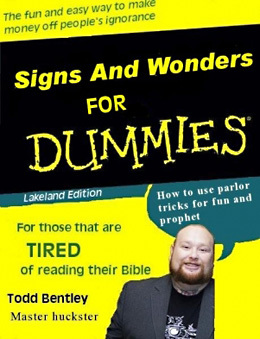 The Lakeland Healing "Revival" lead by 32-year-old Canadian ‘evangelist’ Todd Bentley is in full tilt. Bentley's arms and neck are covered with tattoos, and he wears studs in his chin and left eyebrow, yet nearly every evening thousands gather to hear him preach and hear “Holy Spirit fall! God is here! We want more! More, more, more!". In the video I watched Bentley yells “BAM” over and over again along with the usual trite phrases “Release the revival anointing”, “Release revival glory”. He also screams “Take It” over and over again. (Hmmm! I wonder whether Bentley ever watches Emeril Live on Food Network. Emeril’s famous trademark ... “BAM” as he adds salt to whatever he is making is endearing ...on him. On a so called preacher it is despicable. 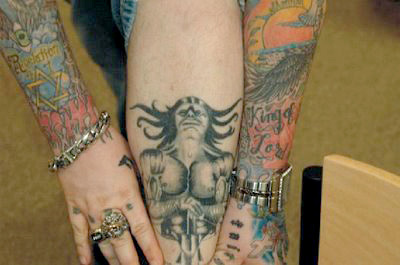 And, most of Bentley’s tattoos seem to have been done over the last 4-5 years. A Youtube video of him preaching in early 2004 at the Toronto Airport Christian Fellowship shows him to be tattoo free: http://youtube.com/watch?v=fFp1tG9z7SM). Link is no longer good. 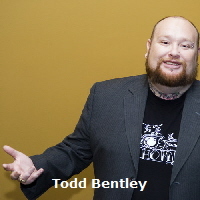 Todd Bentley is far from mainstream. 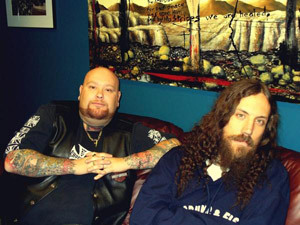 He is heavy set and bearded and his arms and neck are covered with tattoos. He wears studs in his chin and left eyebrow and certainly doesn’t look anything like a typical evangelist. But isn’t being a Christian all about being forgiven for past sins and being filled with the Holy Spirit which helps enable one to live out the rest of our lives in righteousness etc. etc. Isn’t being a Christian more to do with the inside being clean, rather than the outside adhering to some set standard? Didn’t Jesus criticize the Pharisees for their appearance of righteousness while the inside was rotting? There is a disturbing pattern to Todd Bentley’s interests on his myspace page, which has a prominent Harley Davidson symbol at the top. While there is absolutely nothing wrong with Harleys, there is a mind-set here that just doesn’t sit right on a so called minister of God. (Since this report was written, the myspace page has been deleted). The Bible instructs us to come out from the world and be separate (which is the definition of holiness). So isn’t it reasonable to expect the life of a preacher/evangelist/man of God to be a little bit different from everyone else? Are we being unreasonable to expect that this man’s life be salt and light, that he set the example for the rest of the flock to follow, that he display at least some separation from the entertainment and lifestyle of the world. Matrix, Lord of the Rings, Braveheart, Die Hard, Mission Impossible and Bourne on the big screen and King of Queens, Seinfeld, American Chopper and CSI on television. While time and space preclude a meaningful analysis of all these programs, we have dealt with a few. Seinfeld is as dumb as ‘comedy’ get with it’s characters neurotic and conceited at best and immature, dishonest, petty and totally wacko at worst. The immature Doug in King of Queens does nothing but watch sports, play poker and put on weight. American Chopper.... The day-to-day drama of a volatile father and son team (New York natives Paul Teutul Sr. and son Paul Jr) as they create outrageous custom motorcycles. However Paul senior is a hot-tempered tattooed foul-mouthed patriarch who’s every second word has to be bleeped out. Fans of "American Chopper" have come to expect certain things from the reality show: Loud engines. Tattoos. Father and son shouting bleeped obscenities at each other. .
Bentley has a larger version of the picture on the left on his MySpace page. 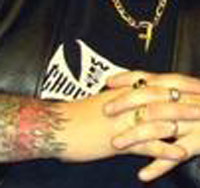 Wondering what the logo on his chest (and sleeves) was, I enlarged it [below right].. Then still not recognizing it, I enlisted my husband, who told me it was the West Coast Chopper logo. Now Jesse James and the rest of the whatever the heck they call themselves, can do and say exactly what they wish. However a so called preacher of the Gospel, who ‘visits Heaven on a regular basis’ can and should be held accountable. The duplicity of Todd Bentley wearing a cross around his neck, which rests on the West Coast Chopper logo on his shirt is enough to make anyone gag. While the man is a despicable hypocrite, what is even worse is that he has carried over his violent tendencies into his stage shows, and the so called Christian audience, not only encourage him, they laugh at his loathsome accounts. I walked up and I grabbed her legs, and I started going, BAM! BAM! I started banging them up-and-down on the plat[form]! She got healed! I inched closer and I went like this [Todd Bentley performs a kick with his right leg and yells] BAM! (audience laughter) And just as my boot made contact with her nose, she fell under the power of God. The remaining moments of the video speaks for itself and demonstrates what happens to Todd Bentley when he is overcome by the so-called "gift of faith." In what may be termed an award-winning theatrical performance, Bentley claims that "God" told him to: run and knock a person to the ground; "Ground and pound;" choke a man; run and hit a man so hard "it drove him back several feet! He hit the ground and his tooth popped right out of his mouth!" (audience laughter) The video ends with Todd Bentley claiming that "God" instructed him to perform a "leg-drop" on a pastor. I hope you realize that this assault would have landed Bentley in jail had it taken place anywhere other than a ‘church. But The Audience Did Nothing But Laugh! NOT ONE of these good ‘Christians’ in the audience objected to this story. Not ONE person stood up and said “Hey! You don’t kick anyone”. NOT ONE person stood up and yelled “We do not serve a God who kicks people”. God forgive us for what we have become. Kenneth Hagin claims the Lord instructed him to hit an elderly woman in the stomach with his fist. (Hagin, Understanding the Anointing, 114-115 and Rodney Browne who attended Hagin’s Rhema college slapped a deaf person so hard the person fell flat on the floor. (Flowing in the Holy Ghost p.53, R.H.B quoted in counterfeit Revival H. Hanegraaff). “Jesus said In John 14:16 he would ask the Father to send another comforter (Greek- Allos paracletos) which means another of the same kind, (a person). Here the Lord calls him our helper, the comforter one that comes alongside, he will be in the Christian, as well as with them. His ministry is to do what Jesus did when he was here physically but mainly from the inside of us. Instead of Jesus being here in the flesh, the invisible Spirit is. So the Holy Spirit would have the same nature of Jesus. Now we need to ask, what was Jesus like? Matthew 11:29 "Take My yoke upon you and learn from Me, for I am gentle and lowly in heart, and you will find rest for your souls." The Jesus of scripture is Gentle, humble, meek. 1Timothy 2:2: for kings and all that are in high place; that we may lead a tranquil and quiet life in all godliness and gravity. 1Timothy: 6:11 But thou, O man of God, flee these things; and follow after righteousness, godliness, faith, love, patience, meekness. Scripture uses the words gentle, peaceable and meek quite often. Ephesians 4:30-32 says "And do not grieve the Holy Spirit of God, by whom you were sealed for the day of redemption. Let all bitterness, wrath, anger, clamor, and evil speaking be put away from you, with all malice. And be kind to one another, tenderhearted, forgiving one another, just as God in Christ forgave you." 1Thessalonians 2:7 "But we were gentle among you, just as a nursing mother cherishes her own children. Titus 3:2 "... speak evil of no one, to be peaceable, gentle, showing all humility to all men. James 3:17 "But the wisdom that is from above is first pure, then peaceable, gentle, willing to yield, full of mercy and good fruits, without partiality and without hypocrisy." While I do not know a great deal about all the music and musicians Bentley extols, he includes P.O.D and U2 on his list of favorites and we all know what they are like. You don’t? Well I guess that has to be remedied. I found the graphic on the right on http://defendingcontending.com:80/ and could not resist posting it here, which in no way should take away from the seriousness of Bentley’s deception. The next video came from on A Little Leaven and brings home the fact as to how similar Todd Bentley’s ‘reading’ are to any of the psychics I have ever watched on television. For example in speaking to a woman, he says ..
That oil coming right now?? What oil? He then asks the woman whether she has any children, to which she shakes her head in the negative. “No Children? cause I’ve just laid hands on you and I feel like there something in that room right now that God’s going to release. Doesn’t mean you’re going to have natural children, it could be that I’m picking up on it because you’re not married, never had children, but the Lord’s highlighting that to me for whatever reason right now. In speaking to another person Bentley asks if she worked in medicine or nursing or anything like that. When the woman says no, Bentley asks if she has ever done anything like that, to which the woman again answers in the negative. Bentley tells the next woman that she need a “creative miracle of the heart”. Whatever that is. Bentley then unbelievably goes down the line “releasing the anointing” and yelling “Boom-Ba” as each person falls to the ground. “I feel like the Lord told me that the man who had the lightning visit him in the late seventies will be a man that I am going to mark with a real gift for faith and healing. Bentley refers more than once to what he is “picking up on” or what he “feels the Lord told him”. So the inescapable conclusion is that either the Lord is mumbling and/or being extremely vague in what He is telling Bentley or Bentley himself is either hard of hearing and/or an extremely bad listener. If you haven’t ever done so please turn your TV on and watch one of the psychics in action. Don’t worry, it is extremely unlikely that evil spirits will rush out of the television set and attack you in your living room. You just have to see the similarities between their ‘readings’ and Bentleys to believe it. And Christians still fall for this claptrap. Contagious Anointing or Contagious Kundalini Awakening? In the following video Todd Bentley [in tones that would make any self-respecting banshee extremely proud] says.. [Do not miss his “vibrating” or having his own “glory party” up there]. Comments in parenthesis and bold mine. “We have an international television audience tonight” (God help us! Now we are dumping the dregs of the earth on other unsuspecting countries). “And the Lord spoke to me in the beginning of this outpouring that ever service, and I have not been tired… at every meeting I was to pray for the leaders coming in from around the world, pastors, missionaries, evangelists that were hungry for a fresh touch on their lives. A New Thing? You Have To Be Kidding! For thousands of years gurus have operated with gifts of healing, miracles, gifts of knowledge and intense displays of spiritual consciousness for thousands of years. For thousands of years Shakti has been easily passed by a touch or by some other method from one already ‘on fire'. “The mere presence of a single being whose shakti is strongly active can awaken the shakti of those around him. Similarly being in the presence of many people whose shakti is awakened to some degree can awaken one's own shakti. Sadly, the so called church has become so used to various fakes spouting exceedingly similar (and tiresome) ‘prophecies’ that no one bothers to even check whether these prophecies actually come to pass. "Beware of false prophets" (Matthew 7:15). These well-known words of Jesus instantly tell us two things: 1) There are false prophets 2) They are dangerous. In fact the Lord took the whole subject of false prophecy so seriously that the penalty in Old Testament times was death for false prophets (Deut 18:20). But this is not all. Willing listeners who have given these false prophets credence are under an equally severe judgment as those who done the actual prophesying, since the Lord made it an extremely simple matter to distinguish a false prophets from a real one, and He did so FOR OUR PROTECTION. The listeners are not excused because false prophets told them lies, for they have given credit to these fabrications. “Listen to this. The Lord just spoke to me and said ‘This IS what will happen tomorrow night, The King and the Kings anointing falls tomorrow night. The 8th of June 2008 The anointing of the king of glory falls. Jesus said “I am coming in person”. The King is coming in person. I sense so strongly there will be a personal divine visitation of the Lamb of God, the Lord Jesus Christ to the revival tomorrow night. He will come in the clouds in His chariot surrounded by a great angelic host because the great honoring of the Lamb of God, the King of Glory is coming to visit Lakeland, to visit the revival, to visit the outpouring. The devil trembles with that knowledge. For tomorrow the King of Glory sets foot upon the stage in Divine personal one to one visitation. “Now for all those watching that just don’t understand the nature of the prophetic ..tho’ the Lord can appear .. I’m not suggesting there going to be a physical flesh Jesus Christ … I hope you understand.. we’re talking about atmosphere. Talking about in spiritual experience. We’re talking about impartation. Wait a minute. Didn’t you just say He was coming in a cloud with all the angels? Didn’t he just say King of Glory will set foot upon the stage in a Divine visitation. How does all that change into “impartation” and “atmosphere”? In yet another embarrassing display Bentley says that his oily hands are a ‘sign’ of the Holy Spirit. “I want you to lift your hand up right now and say ‘God, let the oil appear’. Take a moment and say ‘God, let the oil appear’.. Let the oil drip out of my hands. We can not, for which we have to thank God for small mercies, especially when it apparently smells like “Sheeka-Boom-Ba”. Bentley’s words, not mine. God Wants People To Believe in The Angel. In yet another astonishing ‘revelation’ Bentley says that he has to tell people the full story..
“… if you want to know why God’s moving I have to tell you the whole story. If you don’t believe the story.. well sorry. You know I told the Lord.. “Why can’t I just move in healing and forget talking about all that other stuff ?” He said “because you got to get the people to believe in the angel” I said “Why do I want people to believe in the angel? Isn’t it about getting the people to believe in Jesus? ” He said “The people already believe in Jesus , but the church doesn’t believe in the supernatural. The church has no problem believing in Jesus, what we don’t believe in is the supernatural. What we don’t believe in is angels, we don’t believe in the prophetic, we don’t believe in some of what’s going on, and I’ll tell you what ..we need to have an awakening. Bentley’s god has his facts wrong.. the church has absolutely no problem believing in the supernatural.. We believe the God parted the red sea, caused the sun to stand still, healed many peopled, raised Jesus from the dead (and will one day raise many others). We believe in prophecy, which gives assurance to our faith. We also believe in angels as messengers of God.. that angels announced the birth of Christ, ministered to Him and that a single angel of judgment destroyed the entire Assyrian army (Isaiah 37:36), that angels protected Daniel and his friends, that an angel rolled away the stone from the tomb of Christ, that one angel shall bind Satan and cast him into the bottomless pit and on and on and on. So what part of all this is Bentley going to ‘awaken’ us to? Now let me talk about an angelic experience with Emma. Twice Bob Jones asked me about this angel that was in Kansas City in 1980: "Todd, have you ever seen the angel by the name of Emma?" He asked me as if he expected that this angel was appearing to me. Surprised, I said, "Bob, who is Emma?" He told me that Emma was the angel that helped birth and start the whole prophetic movement in Kansas City in the 1980s. She was a mothering-type angel that helped nurture the prophetic as it broke out. Within a few weeks of Bob asking me about Emma, I was in a service in Beulah, North Dakota. In the middle of the service I was in conversation with Ivan and another person when in walks Emma. As I stared at the angel with open eyes, the Lord said, "Here's Emma." I'm not kidding. She floated a couple of inches off the floor. It was almost like Kathryn Khulman in those old videos when she wore a white dress and looked like she was gliding across the platform. Emma appeared beautiful and young-about 22 years old-but she was old at the same time. She seemed to carry the wisdom, virtue and grace of Proverbs 31 on her life. She glided into the room, emitting brilliant light and colors. Emma carried these bags and began pulling gold out of them. Then, as she walked up and down the aisles of the church, she began putting gold dust on people. "God, what is happening?" I asked. The Lord answered: "She is releasing the gold, which is both the revelation and the financial breakthrough that I am bringing into this church. I want you to prophecy that Emma showed up in this service-the same angel that appeared in Kansas city-as a sign that I am endorsing and releasing a prophetic spirit in the church." See, when angels come, they always come for a reason; we need to actually ask God what the purpose is. Within three weeks of that visitation, the church had given me the biggest offering I had ever received to that point in my ministry. Thousands of dollars! Thousands! Even though the entire community consisted of only three thousand people, weeks after I left the church the pastor testified that the church offerings had either doubled or tripled. There are more than a few problems with this, starting with the fact that no angel in Scripture is ever described as being ‘female’. To add to which The World Kigo Database of seasonal words covering Japanese Festivals and Ceremonies from Buddhist, Shinto and other backgrounds, tells us that. Enma is not female, but the ruler of the underworld in Buddhist mythology and is often referred to as "Great King Enma". Please remember that the God of the underworld can transform himself into “an angel of light” (2Corinthians 11:14). So is there any good reason this Emma or Enma would appear as a woman.. Certainly! Since westerners associate the name ‘Emma’ with women, an obviously masculine looking spirit with the name would cause much head scratching. Bentley says there is “an angelic realm in Heaven, devoted to the finances”. Using Revelation 11:15 (“The kingdoms of this world have become the kingdoms of our Lord in Christ) for support, He then goes on to say..
"The God of heaven shall set up a kingdom, which shall never be destroyed: and the kingdom shall not be left to other people, but it shall break to pieces all these kingdoms, and it shall stand for ever." Neither of which has nothing to do with finances or healing. Revelation 11:15 is where the seventh and last trumpet of the trumpet judgments is blown. It represents the certain and glorious outcome of the age-long struggle against Satan, who wields the kingdom of the world, which he offered to Christ on the mountain for one act of worship. The climax comes with Christ as conqueror of the kingdom of this world for his Father. This verse is the crowning lesson of the Apocalypse. Anyway back to TB and his vivid imagination. After blathering on for a while about incredible financial breakthroughs (For whom?) and “a whole lot of supernatural giving going on’, he goes on to tell how he was sitting in a meeting (in Santa Rosa) and fell into a trance, which he describes as “a dream like state but you’re awake… A state that you go into to have an experience” Why trances? According to Bentley... “God wants to get your attention, cause your brain’s too busy”, but “you know when they are coming and you can actually resist it”. Bentley says that over the years he has had many trances and uses a couple of Scriptures to back up his experiences. First he says that “God cause a deep sleep to fall on Adam .. it was a trance like state”. He then says that Peter fell into a trance in Acts 10. However Acts 10 says absolutely nothing about Peter falling into any kind of trance. All it says is that he “saw a vision.. an angel of God coming in unto him”. In fact, unlike Bentley who claims that quite often he cannot even move but just sits there during one of these trances, Peter was very afraid and spoke to the angel saying “What is it, Lord?”. “..saw heaven open and as I ascended a ladder. I ascended into the heavens…I saw white feathers, I mean these feathers were as real as any bird in the natural. This was not a vision .. these were full vibrant wings. And then I noticed the wings move and there was an arm under one wing and an arm under the other wing and when the wing was lifted I saw ever precious gem, ruby, stone treasure diamond….every treasure you could think of under the angels wings. Then the angel stood and he has the body of a man and six wings. And it’s the angel of finance. I have seen him on two other occasions. “The most significant meaning for gold is of course in the realm of alchemy, and most people know that the aim of alchemy was to transmute base metals into gold. Although this was actually attempted as a chemical process, the real meaning behind alchemy was a spiritual transformation of flesh into divinity”. It seems that God has reemerged at Toronto as the cosmic dentist — a mystical Dr. Midas — a celestial tooth fairy, a heavenly Goldfinger, who fills teeth and sprinkles a little gold dust besides. What will God think of next? It seems that the celestial tooth fairy has now shown up at Lakeland. In the process of her physical healing of four types of cancer, oil began to flow supernaturally from her body and later, gold dust began to be manifested on her face and the crown of her head. As she praises and worships, this phenomena [sic] is seen. Her Brazilian pastor gathers the holy gold flakes and anoints the forehead of the sick and needy. “The visions at Conyers, Georgia, USA have taken the same course as the ones at Fatima, Garabandal, Medjugorje and other places. They appear at regular intervals and various supernatural signs are manifested, including signs in the sun. Amongst the signs at Conyers is that of gold dust. The following extracts were taken from the Conyers web site, "Messages From Jesus And Mary"
I feel truly sorry for those who need to have a sprinkling of gold dust before they can believe God loves them!” Incidentally the only Scripture that mentions Gold Dust is Exodus 32 when the children of Israel were punished for the sin of idolatry. In Todd Bentley’s Article Angelic Hosts Bentley issues the invitation to eat from the Tree of Life. Now let’s compare this with God’s word. Moreover the Bible tells us that God placed an angel at the east of garden to guard the way to the tree of life. In other words NO ONE is allowed near the tree and NO ONE can eat of this tree lest they should live forever. There is absolutely NO indication that God has instructed the angel to let some men through, nor that some can eat of the tree. In the following video clip taken off Bentley’s site he talks about the first couple of months of being a Christian and being at a Catholic charismatic church, attending Mass, which he describes as his “hottest meeting”. The young guy (Ahem! older guy) that discipled Bentley in “the prophetic” was called “Frenchie” and was a “seer prophet” up there with Bob Jones.. (Ouch!) and operated like an X-ray machine. “you’d walk into a room and he’d see the demon that followed you into the room”. Bentley is of course astounded as he considers himself a born again Christian who reads the New Testament in one sitting (and attends Mass on Monday). The Lord insists, so Bentley walks up the Frenchie, starts to whisper in his ear but then begins to “manifest a demon”. In fact it wasn’t his voice anymore since he “was so possessed by this spirit that literally my voice started speaking in another voice” but yet he was aware that another voice was speaking that was not his voice, but he had “no control” and could not get himself back. He “could feel something rising up through his flesh” and knew that there was a demonic power controlling him. (Sadly, at this point, I have to completely agree with Bentley.. there is a demonic power controlling him and it has never let go)..
(Actually profanity coming out of Bentley’s mouth almost every time he opens it). Bentley then goes on to tell of when he was living with his mother (who was deaf) and would hear growling etc. from her room in the middle of the night. Then he would hear what sounded like ten people fighting in his mother’s room with mirrors breaking and dressers falling over, but when he opened his mother’s door nothing was out of place and his mom would be fast asleep in her bed. This happened on another occasion, except that this time his mom was on the floor crying with a broken arm. He goes on to say that to this day his family believes that he broke his mother’s arm since there was a time in his life that he “was so filled with rage” that he did beat his mother. Is Todd Bentley’s Lakeland Outpouring Like the Day of Pentecost? Aptly expressed by one blog site.. The Tampa Tribune reported on May 2nd, a comment from one of the many supporters of the Lakeland Revival/Florida Outpouring. “It’s like the day of Pentecost,” said a gushing fan. Well, there’s many reasons - biblical and historical - why what is happening at Lakeland is NOT like the day of Pentecost - unfortunately. The key is, that far than hearing the gospel being preached boldly in their own tongue, and the wonders of God proclaimed, and the lost getting saved in large numbers, the lost, even in the immediate vicinity of the church buildings, are unaware of what is even really going on there, far less know the message being preached (which is not one of real repentance anyway). Pentecost was about the gospel being preached - the people being empowered and emboldened by the Holy Spirit to fulfill the Great Commission. Pentecost’s immediate, instantaneous effect was the empowerment of the fearful assembled church to go about the bold preaching of the cross in the face of intense persecution - to prophesy the wonders of God (pp Joel) in order to win converts, and more than converts, to win disciples. Many were added to their numbers that day because of their preaching, prophesying and testimony. There was rapid church growth. But the lost were not won to Christ by looking at the manifestations and thinking them a wonder in themselves - although they were a wonder - no, rather it was the WORD that they heard in their own languages that came through these manifestations, these wonders, and it was this message - bold and clear - that they responded to and were saved by. Pentecost succeeded in getting a hidden church to be public again - to get out there, onto the streets, and to fulfill the Great Commission. Pentecost succeeded in getting the gospel heard and proclaimed to many thousands of new people. Pentecost succeeded in enlarging the church with new members (eg not just sheep stealing from other churches). Pentecost succeeded in the salvation of many souls. And it was rapid. So Pentecost ultimately was about getting a bold empowered church out ‘there’, out from the upper room to the world, to get a lost world into the kingdom of God. Lakeland’s emphasis is about getting people (almost exclusively converts from other churches) to come to THEM into their ‘upper’ room to stay. It calls them into a room, to stay in a room, to focus on what is happening in that room, to focus on the manifestations in that room and the minister in that room, rather than calling them out into a dying world. It calls them again and again into this upper room, hungry and insatiable for more, to glory and revel in the drunkeness and experiences and to focus on self. The dying world is forgotten about. The dying world can wait. It seems to me that very little can be said to sum up Todd Bentley and his revival other than using words from Scripture that, no doubt, he will hear himself one day.. “You have been weighed in the balance and found wanting”. Todd Bentley is a dangerous man and you will pay the same price as he will, if you encourage, listen to and follow this minion of hell. As Marsha West rightly says “The leadership at FFM and God TV must have known something was going on behind the scenes”. While, I doubt that anyone will be held accountable.. the damage has already been done and most of it cannot be undone. Thousands of people believed there was a “revival” going on and traveled from all over the globe to be a part of it. Some went hoping to be healed, others just to be a part of this ‘move of God’. However the ‘revival’ left people unhealed and quite possibly unsaved, proving, once more how easily and thoroughly we can be deceived. I wonder how many of the the Lakeland participants even now realize that they have been hoodwinked by one of the wolves spoken of in Acts 11. A wolf that was backed by the entire pack. What pack of wolves am I referring to? Only the infamous ‘Christian’ leaders such as C. Peter Wagner, leader of the International Coalition of Apostles, Ché Ahn, John Arnott, Bill Johnson, Rick Joyner and several others who came to the 10,000-seat tent to support what Todd Bentley and Fresh Fire were doing and to commission him as an evangelist. Note that most of this ‘ceremony’ took place with Bentley standing there with a stupid grin on his face with his head shaking from side to side.. I have often wondered if the man has epilepsy. Alice Rhee, NBC News Producer. Revivalist claims hundreds of healings. Cary McMullen. Florida Outpouring: Internet Draws Thousands to Lakeland Revival. May 18, 2008. Cary McMullen. Evangelist's Popular Ministry Claims Miraculous Healing. Saturday, April 19, 2008 TheLedger.com. Evangelist's Popular Ministry Claims Miraculous Healing. Saturday, April 19, 2008 TheLedger.com. Greg Kucera. Monster Garage: Jesse James, West Coast Choppers, Custom Motorcycles And Harley. May 31, 2007. 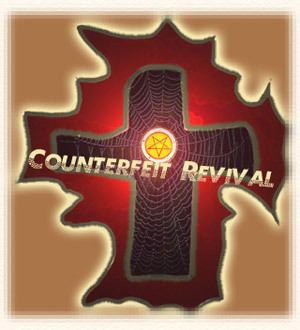 Reports of Revival Breaking Out in Lakeland, Florida, Fresh Fire Ministries. April 11, 2008. Sadhu Sundar Singh and the New Church. by Eric J. Sharpe. Bayside Swedenborgian Church. Prophet Bob Jones and The Florida Fires. The Kansas City Prophets. Excerpted from "Heaven Can't Wait" by William M. Alnor, 1996.